You can change the world, and we can help. impacting the world through prayer for 30 years. dozens of topics. That way you can find a prayer, that will help voice your heart to God. Just choose a Topic, enter the name of a person or place, and we’ll provide a scripture-based prayer to spark your intercession. every nation on the planet were calling for America and the coalition to pull out. Politicians in the US on both sides of the aisle were ready to throw in the towel. mobilizing prayer for the troops and people in Baghdad. staggering, as you can see from the chart below. 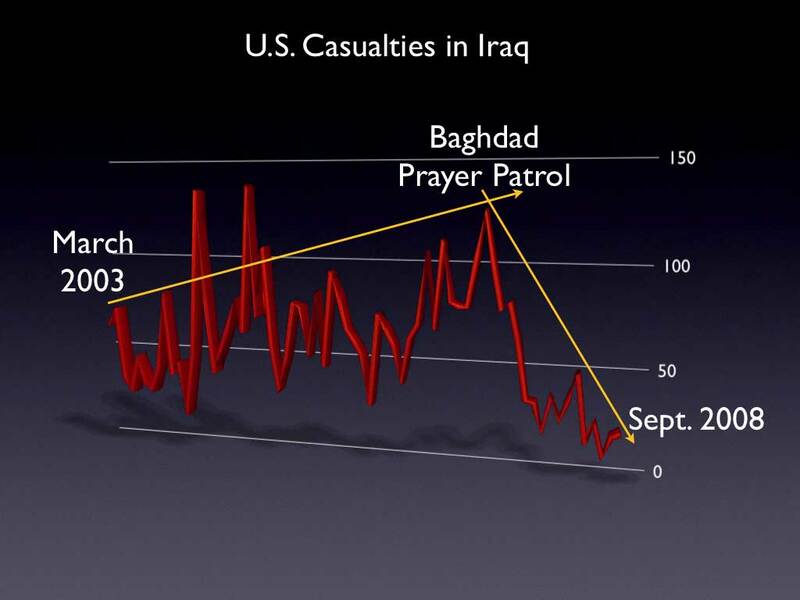 The Baghdad Prayer Patrol was so successful that soon I was getting requests for other patrols like, Israel, Wash. DC, Topeka, KS, Afghanistan, etc. of peoples, nations and troubled spots around the globe.